SysAdmins and security pros – get more from the world&apos;s leading firewall with this book. You can always do more to secure your software, so start here. pfSense has the same reliability and stability as even the most popular commercial firewall offerings on the market – but, like the very best open-source software, it doesn&apos;t limit you. You&apos;re in control – you can exploit and customize pfSense around your security needs. If you&apos;re familiar with pfSense you probably knew that already. This book builds on any knowledge you may already have, and provides you with a clear route to expand your skills and pfSense&apos;s capabilities. You&apos;ll learn how to customize and configure pfSense to construct a firewall that can protect you from any potential security threats. Find out how to set up a VPN, and build a high-availability system that provides redundancy and fault tolerance – essential when security and software performance are so interdependent. With further guidance on how to use a diverse range of third-party packages – all of which will help you unlock more from pfSense, this book covers everything you need - and more – to get a high-quality, reliable firewall up and running for a fraction of the cost. 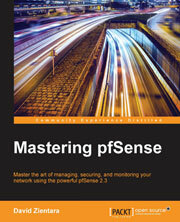 Practical and actionable, tackle some advanced functionalities of pfSense with minimum fuss. We know you don&apos;t just want an instruction manual – you want to put the principles of better security into practice. That&apos;s exactly why we produced this book.